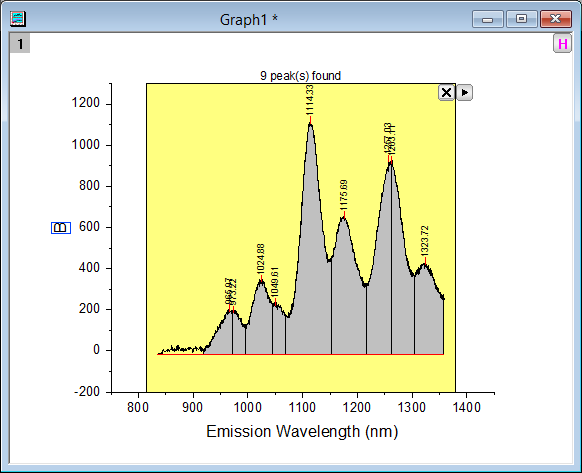 Origin’s Quick Peaks gadget is a handy tool to find peaks in spectrum. 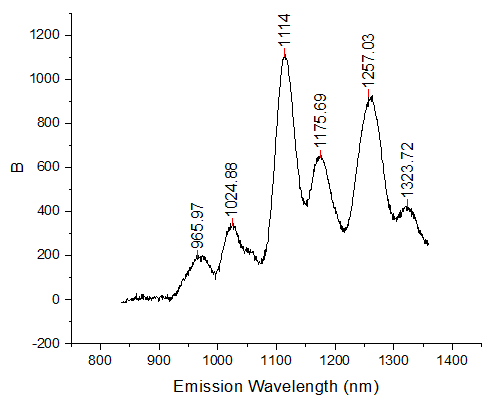 But sometimes the spectrum is noisy so more than necessary peaks are found and labelled in graph. You may want to delete those unnecessary ones. 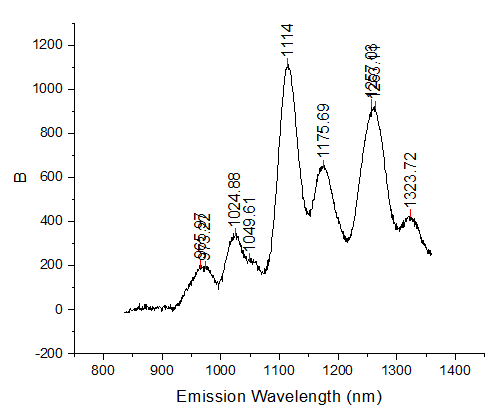 Here is an example of how to remove some peak labels, (x=973.22, 1049.61 and 1263.11). Please download the zip file DOC-2619_delete_peak_labels so you could follow the steps. Open the opj file in the zip file in Origin. Quick Peaks gadget is on Graph1 window. 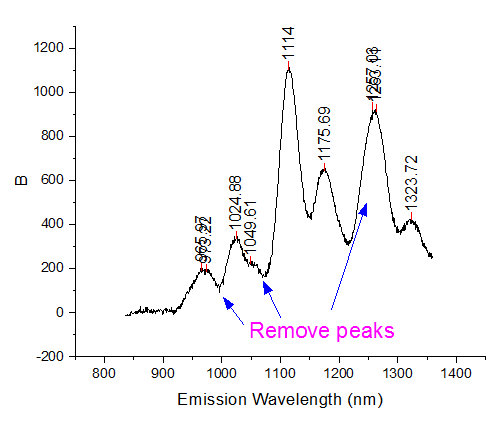 I have customized the baseline and peak finding method so that 9 peaks are found. Click the > button next to the gadget and choose New Output. Then click X button to close the gadget. 9 peaks are labelled in the graph. Click on the labels and use Format toolbar to make the font size bigger. 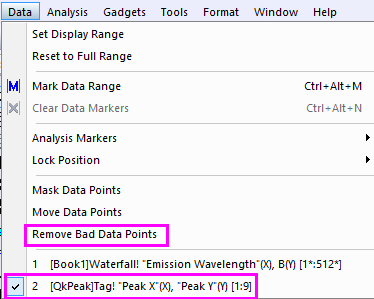 To delete some peak labels, choose Data menu and select [QkPeak]Tag! “Peak X” (X), “Peak Y” (Y) [1:9]. Your cursor will change into a target. 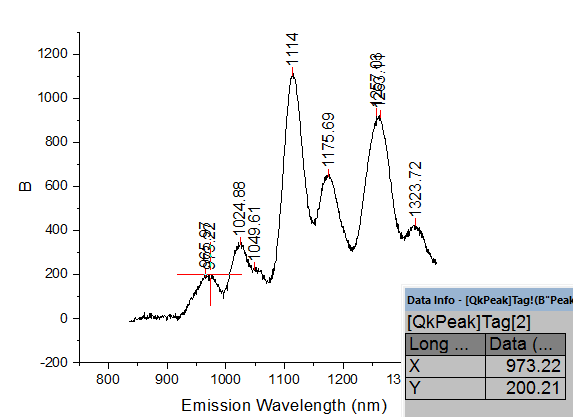 Click on the peak label at 973.22 and press Enter key to delete it. Click on the peak labels at 1049.61 and 1263.11 or press right arrow keyboard to located them and press Enter key to delete them. Note: The Remove Bad Points tool only works on active plot. By default the first plot in graph is the active plot. That’s why we need to first select the Peak label data as the active plot and then use this tool.